£5.00, book your tickets here. As university fees sit at record highs and the cost of accommodation and living in major university cities continues to spiral, the gap between working-class and lower-middle-class students and their more well-off peers grows wider and more self-evident. The idea of a ‘flattened’ culture is being exposed for the myth it is, and the ‘classless society’ truly has never arrived. 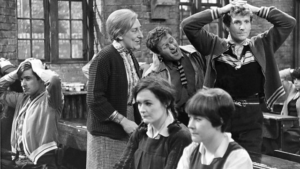 This programme represents a timely intervention in a phenomenon currently being underexplored; by returning to two classic British television presentations of the ‘working-class homecoming’ we can begin to find some representation of the experiences of current young working-class people attempting to bridge the gap between two worlds- the world of privilege and ‘opportunity’, and the oft-threatened and ‘common’ world of their background, and what happens when they return to the place of their birth. Stand Up, Nigel Barton (1965, The Wednesday Play) is acclaimed television playwright Dennis Potter’s first great play; Potter draws on his own experiences of moving from the mining villages of the Forest of Dean to Oxford on a scholarship in showing a young man (Keith Barron) tortured by his inability to fit in with rich academia and student life, and his alienation from his old village way of living. Mocked by both his fellow students and his father’s friends, Nigel attempts to untangle a knot of guilt-ridden memories and find the room at the top without betraying his family background. Presaging Potter’s celebrated Blue Remembered Hills and The Singing Detective, Stand Up, Nigel Barton demonstrates the ways that those who attempt to traverse class boundaries can find themselves caught in a sort of no-man’s land. The Land of Green Ginger (1973, Play For Today) is rarely-screened but is a jewel in the crown of the career of Alan Plater (The Beiderbecke Affair, Trinity Tales). Plater’s alter-ego is Sally (Gwen Taylor), a young woman who has moved from university into a career in London. Offered an long-term job abroad she attempts to make up her mind about whether to leave or return to Hull, her family roots and her fisherman boyfriend. Almost impressionistic at times in its montages set to folk songs performed by The Watersons, the play serves as a celebration of Hull and maritime industry, a bitter lament for its decline and (again) a portrait of the siren call of the past, a working-class rootedness that is nonetheless under attack by the ruling powers, grappling with ideas of personal social and economic mobility.